Does it work with ECS? and I'm not understand how to set up it, can I download it NewGRF Settings? viewtopic.php?t=69827 , works well with ECS .Set up and useage well explained in the first part of topic .Agreat script have fun and enjoy . I have updated the RCG-6 by Monty_Montana to work with FIRS3 economies (this option will probably work for earlier FIRS versions but I didn't test that). But I get some strange messages in debug. After packing all files up into a .tar again with 7-zip, the script seemingly works, i.e. it can be selected in the AI/Game Script Configuration and I can also select "FIRS3: All economies" in the script configuration. 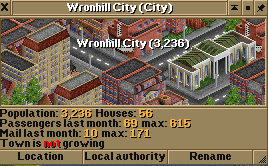 I'm a complete noob with OpenTTD customization, hopefully I did this right. I attached my fixed version of your archive. I can't get it work with FIRS 3.0.10. I tried the above and still I got a warning that industrial set from GS doesn't match the initial cargo list from the game. The same happened when I tried to do it manually as indicated here. Does it work for you? Do you guys have any ideas what can I do to make this script work well with the newest FIRS3? If you start the script with debug turned on, then look at the debug log and you will see the order that the commodities were loaded into the array. Make sure the order in your list in the script matches this order in the log. If you need to change the order, be sure to change the relative position numbers in the lower part of the script that matches the commodities to the groupings. I have a stupid question. How do I enable this? I downloaded the script & the dependency ... yet I don't see any target / goals for a city. EDIT: I'm trying this with no other NewGRF activated. 1. In the main menu, click "AI/Gamescript Settings". 2. Select the text in the box under "Gamescript"
3. Click the top-left-most button in the bottom menu labeled "Select Gamescript"
4. Pick a gamescript of your choice from the pop-up menu. 3. Click the 'Configure' button. 4. A row of parameters defined by the gamescript will show up. Change the desired parameters and click the 'Close' button to implement the changes. Use the 'Reset' button to set all parameters back to default values. Someone should write that in the readme.txt. Is this behavior normal? I'm bringing in both Goods & Passengers/Mail. Thanks a lot it really works! Also complete noob for that, and cannot figure why tar generates errors while uncompressed dcript doesn't.